Ok, I've managed to squeeze in some VERY late nights here, and eventually finished the new structures I've been working on at last. 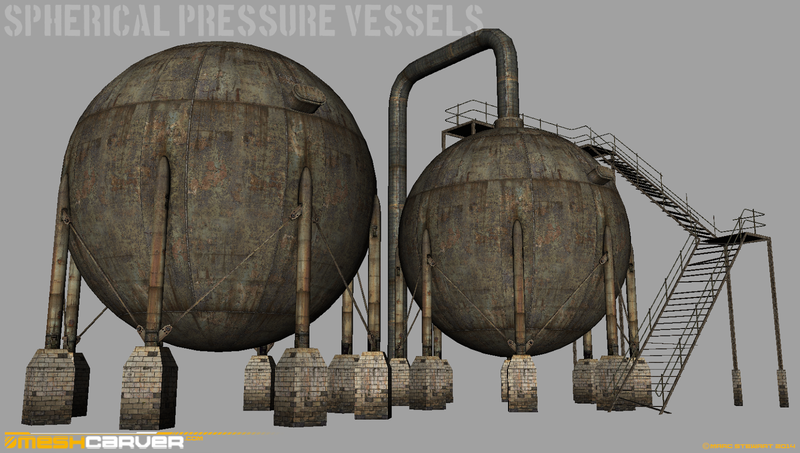 These are medium sized Spherical Pressure Vessels, and there's two variations of them- one is the basic one and the other is linked to the "underground" (Don't get your hopes up yet!) by an inlet pipe and has a raised platform accessible by stairs. I've always loved the strange look of these containers when I see images of them or in real life- they look like they might just start walking towards you or something..! 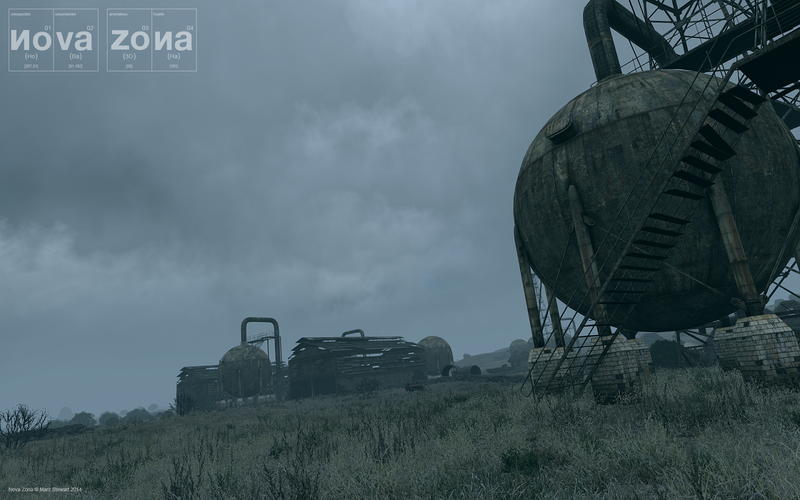 I have chosen to make some for NOVA ZONA as they are such a weird and alien sight on the landscape and lend a feeling of other worldliness to the island. From a distance they really help to break up the horizon line with simple spherical geometry that looks very out of place- this is going to be a continuing theme in my development; creating large big bold basic geometrical shapes that will turn the skyline of NOVA ZONA into a very uneasy place to be. I've changed them a bit from how they'd look in real life so as to fit better into this environment- things like making the base supports that horrible industrial tiling you used to get and rusting the hell out of them with drab colours. As a final treat and because it's been so long since the last update I decided to make my first EVER Youtube video (Yahhh!) showing some of the structures I've already got in game and working. There is a lot you'll have to excuse about this video though- firstly I haven't the foggiest idea about best settings when recording (FRAPS) or uploading, so I don't think it's the best quality but maybe someone can PM me with some advice for future ref? Ok guys, I hope you liked this update and I'd love to hear any feedback you might have. It's probably going to be a LONG time again before I get the chance to work on this, but I'll try to find time when I can. I suggest you revisit the ground connection parts though. It currently looks a lot like the spheres are on stilts, the brick foundations need some major love. For one, geometric perfection on something that looks like it was built 30-40 years ago? For another, sloped triangular bricks? The poor stonemason who had to lay those. When I look for photos of pressure spheres, they all seem to use flat concrete foundations to give the whole building some stability. Aye, I took the design almost directly from an old photo by the renowned photographer Bernhard Becher. The vessels do indeed look geometrically perfect (Unless you meant weathering, and knock a few tiles out..?) and do have sloped top edges to the supporting bases. Granted there are no bricks to the bases- but I decided to place "clinical" looking tiles over them as a nod to the STALKER aesthetic. I wanted them to read like suspended spheres..! It's a look I'm very happy with as it is, even though you probably wouldn't get those tiles on a structure like this in the real world, but that's the point of this project- to make a place quite otherworldly without going over the top. Again, thank you for your input man, it all helps keep me on the path..! Lookin forward to this, big STALKER and ArmA fan here.